I'll be honest, sometimes I make mistakes in my DIY adventures. I have no design training or special skills, I just know what I like and I'm trying to learn as I go. This light fixture is my most recent misstep. It worked out in the end, but here's what happened and how you can avoid my mistake. The rug for the dining room arrived a couple of weeks ago and I've been anxious to add some finishing touches, including a light over the table. 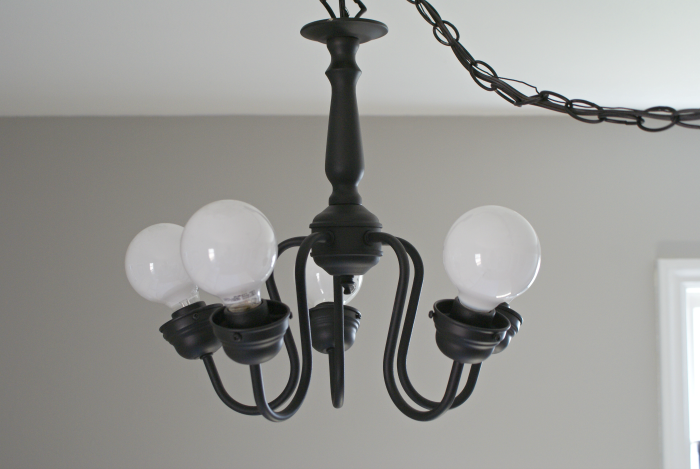 My idea was to find a dated brass chandelier a la 1995, spray paint it black and add vanity bulbs. I found a light at Re-Store (for only $25, holla!) that I thought was perfect. But, when I got it home, I discovered it was too small for the space. "Shoot." I thought, "is there a ratio or something that designers use?" A quick Pinterest search answered my question. Yep! There sure is! Drat! I should have looked that up before I went shopping for a light! Lesson learned! So, the fixture I bought wasn't going to work for over the dining table, but I thought it might look nice in our bedroom so I went ahead with my plans. Luckily, it turned out great! Plus, Jesse taught me how to wire the light (yay, new skill!) so I can do the next one myself. Here's a before picture of the light. Please forgive the terrible photo, I was in a rush and didn't realize my camera was on the wrong setting. First, I wiped off all the dust and oils. Then, I removed the old glass shades and hung up the light outside, our laundry line pole works very well for this! I used several coats of paint and primer in one. For this, I used Valspar Paint + Primer in satin black. Tip! Stuff the light bulb sockets with paper towels to keep spray paint out of them. 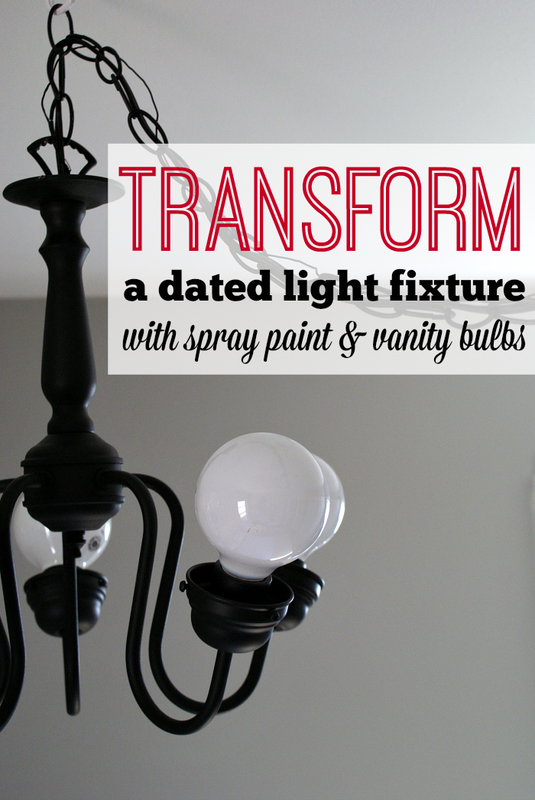 Once the paint had dried and cured, I added 40 watt vanity bulbs that I found at Ace. I tried 60 watt first, but the effect was way too bright. Lastly, I begged my husband to install the light for me. I also had him show me how to do it and honestly it seems fairly simple, it's just kinda intimidating because..electricity. 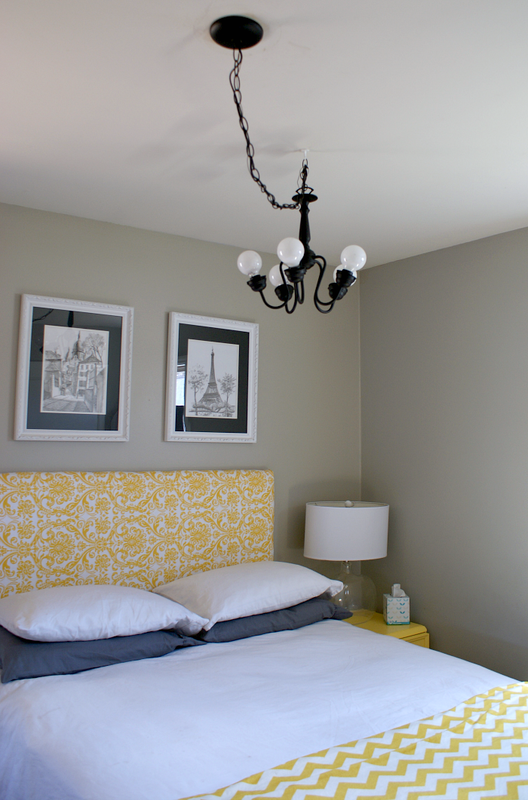 Adding a mini-chandelier to the bedroom wasn't a project I was planning on, but I would call it a "happy accident." Do you have any DIY lemons that you turned into lemonade? Looks great! Spray and bulbs made a huge difference. That's my kind of makeover....pretty on a budget! Thanks, Amanda! I must be entering a lighting phase because I bought two more small fixtures during lunch today! I don't think I would have spotted the potential in that fixture; but it looks great in black and with different bulbs! What a completely different light - love the look and the headboard too!